Dealing with Technology with little ones is new and tricky. I reached out to other moms that are making it work and put together some tried and true ways that other moms and I have found helpful in dealing with kids when it come to setting healthy habits and limitations with technology. I have two older boys who grew up before smart phones and iPads and then almost ten years later I had two more kids. There are new challenges in parenting my two little girls now than there were back when I just had my boys and nothing but a computer and a land line phone. In a time when technology is available at the palm of your hand new problems and situations arise in parenting. More and more moms find their kids having complete meltdowns when kids don't get their daily dose of screen time, or toddlers wanting to watch Netflix first thing in the morning, or even moms who find their little one in the middle of the night on a stollen iPad under their covers. Kids are starting not to know how to play without an iPad or play with other kids. Finding healthy boundaries with kids and technology is becoming a problem. So what helps? 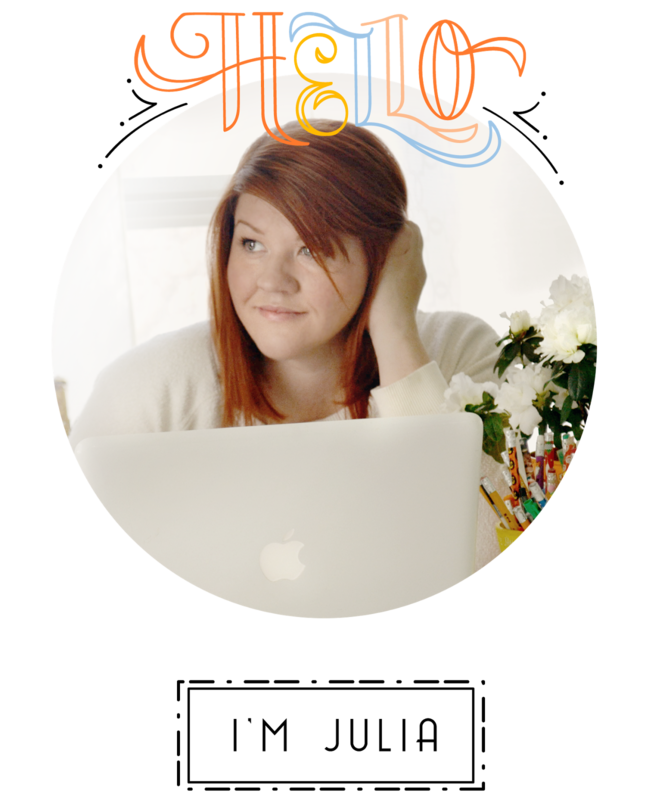 I reached out and asked the question "How do you help your little one create healthy habits and a healthy relationship with technology?" And the mom's answered. 1. Routine Skip: Don't make any screen time apart of their daily routine. If you give your kid an iPad every time you cook dinner, so they stay busy while you're cooking, and then you try to make them play with toys next time you cook dinner... they are going to have a melt down. They will see the new play time as a punishment and a direct violation of their routine. Its like breaking a promise to them. Keep screen time limited, on different days, and at different times so they don't grow expectant of screen time and/or associate it with anything. This will also help to lessen the entitlement attitude of technology. 2. Independent Play: Set aside 1/2 and hour to a full hour of independent play, where you child plays all by themselves without mom or dad, siblings or friends. Being able to play by themselves and learn to entertain themselves for short periods of time (instead of being on a tablet) is an important skill to develop. If you haven't practiced independent play before, it might be very hard on your little one at first. The more you make independent play apart of their daily routine the better they will get at it. 3. Transition Plan: A transition plan is laying out a plan and expectations ahead of time. Before you allow your child on the device or watch TV layout a plan and what you expect from them. Example of the plan: You only have this set of time to play, next setting a timer, give a five minute warning when time is almost up and then a 1 minute warning. Then when time is up have your child turn it off and put away the device so they are more apart of the transition instead of you just taking it away. This limits meltdowns and anxiety about not having the device. Plus it helps them feel more in control and promotes empowerment over the allure of technology. 4. Electronic FREE Day: Have one day a week where the whole family has a tech free day. It helps reconnect and get your family back to the basics so you all can recharge your personal batteries. Some families find it helpful to have a set time everyday around dinner to have a few hours of no devices, like from five to seven at night. It limits distractions and gives everyone a much needed little break from the outside world. You will find you are more present with the most precious people in your life and your little ones will follow by example. 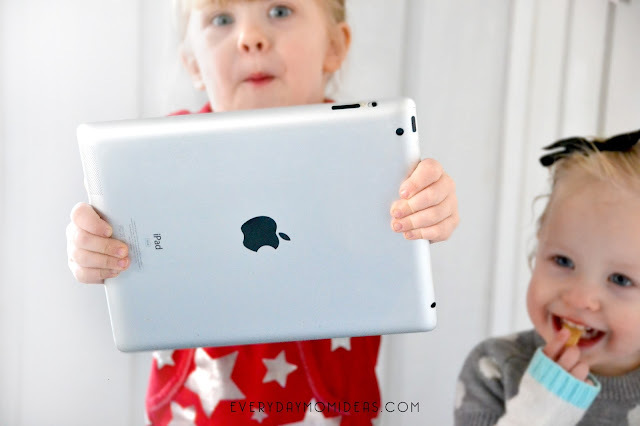 You can check out my families story about our screen free day we do weekly, and why we love it. 5. Lead By Example: Take a hard look and ask yourself if you are on devices too much? Does your little one see you on your phone all the time? If so make adjustments and show your kids healthy habits to keep control over your devices not the devices over you. Children are great imitators. 6. 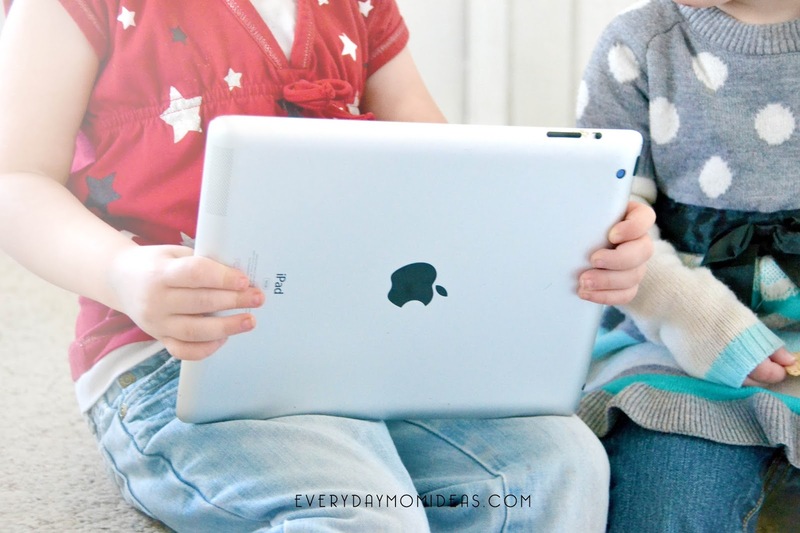 Use Timers: There are lots of great apps out there that monitor screen time with timers. I have heard a lot of good things about Disney Circle app. It shuts down the device after a certain amount of screen time. 7. Earn It: Have kids earn screen time hours with chores, good grades, and good behavior. 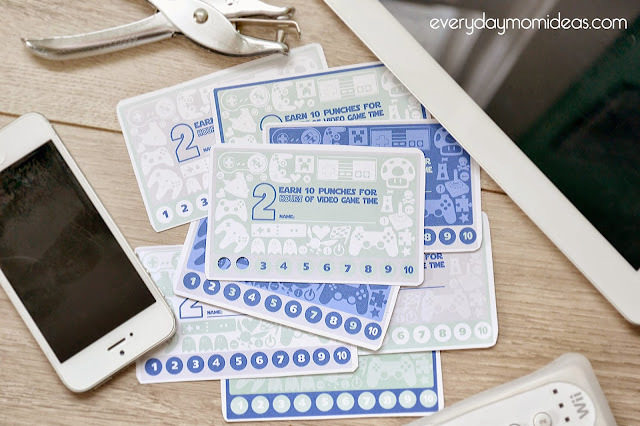 One way is to use a punch card reward system and at the end of the week they can turn them in for video game time, tv time or any screen time. You can get a FREE video game punch card printable here. 8. Delayed Use: This is very similar to earning screen time. Before your kids can spend anytime on devices they need to complete a list of items. Once the list is done they can have screen time. 9. No Personal Devices: Lots of moms encourage to never get your kid their own electronic device. 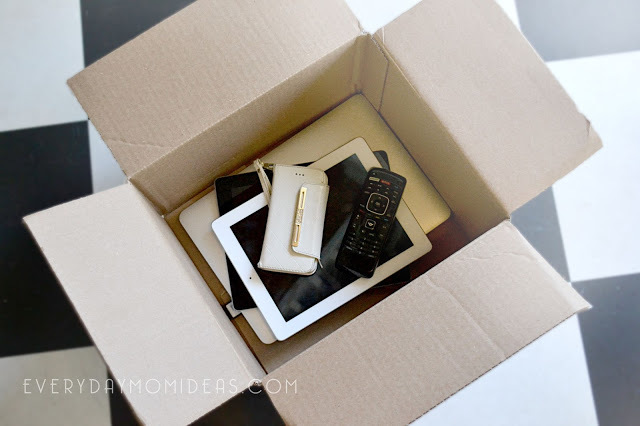 You can have a family tablet or an extra smart phone the family uses but don't give your kids their own device. This will help limit tantrums and screen time. When a kid has their own electronic device they feel entitled to use it as much as they want, and they have yet to develop the skill to limit their use on their own. Limiting time and maintaining control over devices while kids are young is crucial to the development of impulse control at this age. 10. Wait Till Two: An overwhelming number of moms encourage to delay any use of electronic devices till at least two years old, even using your phone. This is to avoid an iPad or mom's phone turning into a pacifying object to your baby. Some moms say they have seen a lot of success with not even letting their babies touch their phones. It works great because as their babies get older the babies don't even think about the phone or iPad because they have never had it and because of this those tech melt downs are avoided completely. Every family and every kid is different. Some of these suggestions will work better than others. Thats why I love this list so much. These are all amazing ideas that are already working for so many families out there. My best advice would be consistency. If you are implementing some of these techniques into your home be consistent about it and give it some time. Change is hard but the reward will be lasting. Do you have any awesome tips for Healthy Tech Habits we don't have listed? What works for you and your family? I would love to read your tips and comments. Sharing Is Caring! Please share this Pinterest friendly image below with your friends and family, or save as a valuable resource for later.